Radiant Saunas are the safe, effective and affordable way to relieve stress and improve health, right in the comfort of your own home. This 4 Person Cedar Corner Infrared Sauna is perfect for relaxing and rejuvenating with family and friends and fits conveniently into the corner of any room. Exclusive InfraWave FAR heater technology emit ultra low levels of EMF, making them safe and beneficial to your health. Its EZ Touch dual interior and exterior LED control panels allow for easy temperature control. This unit is available with Carbon heaters and is loaded with tons of extras, including: towel hooks & magazine rack, CD Player with mp3 plug-in, back rests, 7 colour chromo therapy light and an oxygen ionizer. Constructed from top grade Red Cedar with tongue & groove joinery to create a superior strength edge to edge, these saunas are built to last, providing you with years of health benefits and stress relief. 4-Person Cedar Corner Infrared Sauna with 10 Carbon Heaters Radiant Saunas are the safe, effective and affordable way to relieve stress and improve health, right in the comfort of your own home. This 4 Person Cedar Corner Infrared Sauna is perfect for relaxing and rejuvenating with family and friends and fits conveniently into the corner of any room. Exclusive InfraWave FAR heater technology emit ultra low levels of EMF, making them safe and beneficial to your health. Its EZ Touch dual interior and exterior LED control panels allow for easy temperature control. This unit is available with Carbon heaters and is loaded with tons of extras, including: towel hooks & magazine rack, CD Player with mp3 plug-in, back rests, 7 colour chromo therapy light and an oxygen ionizer. 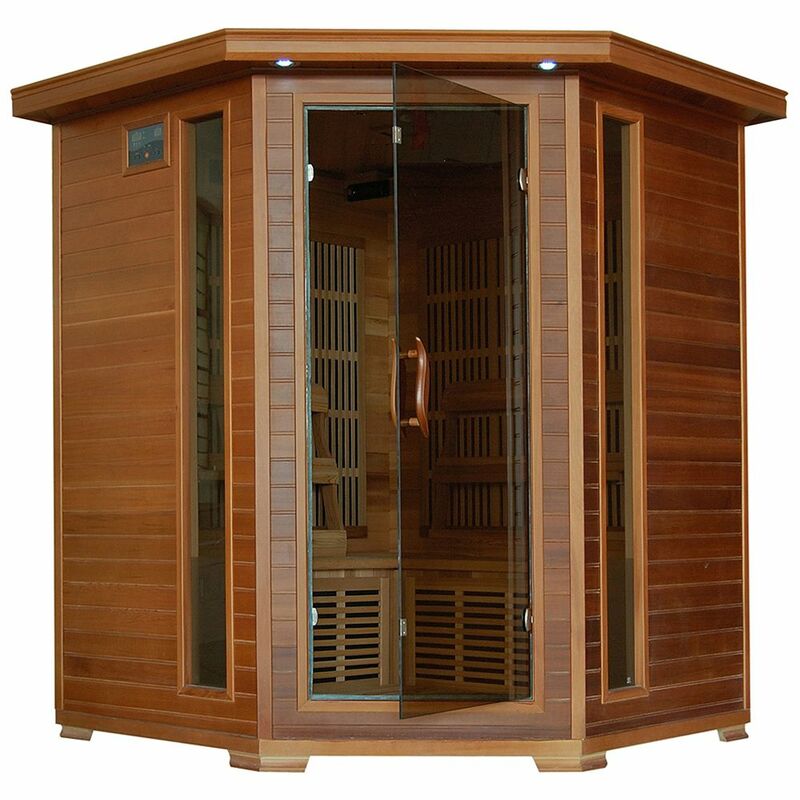 Constructed from top grade Red Cedar with tongue & groove joinery to create a superior strength edge to edge, these saunas are built to last, providing you with years of health benefits and stress relief. 4-Person Cedar Corner Infrared Sauna with 10 Carbon Heaters is rated 4.8 out of 5 by 6. Rated 5 out of 5 by Popsicle from Love, love, love my new sauna!I feel absolutely refreshed and... Love, love, love my new sauna!I feel absolutely refreshed and energized after a sauna session! I am almost pain free in my shoulder and legs.I would definitely recommend this sauna and would recommend Home Depot With a five star rating in efficiency and customer care! Rated 5 out of 5 by Bill from I originally purchased a JNH sauna, and ended up with this one as a replacement sauna. I could no... I originally purchased a JNH sauna, and ended up with this one as a replacement sauna. I could not be happier! Radiant Saunas are packed way better, and way more extras come with it. Rated 5 out of 5 by GRThompson from We picked this up from our local store today. The instructions for set up say that it is a three... We picked this up from our local store today. The instructions for set up say that it is a three-person job. However, my wife and I--both very determined people, mind you--completed it in about two hours. Some of the hardware feels a bit low-quality, like the buckles that hold the side panels together, However, once together, this is a solid set-up. I did have to run to the hardware store to get a 20amp plug, as this has a different kind of plug. Check that the circuit you are putting this on is at least a 20 amp breaker and make sure this is all you are using on that line. Again, I'm pretty handy so making the outlet switch work was not a problem for me. The instructions are clearly written by a non-native English speaker. Use some common sense and you'll be fine! Our first sauna-- 30 minutes of hot bliss-- came on the same day as we picked this up. Couldn't be happier with this purchase. Rated 4 out of 5 by Michigander from Good Value Sauna functions very well, heats up quickly, finish is fine but not a high end unit. Construction is sufficient, but if slightly abused seems as though damage could be easily caused. Overall a great purchase if used by adults only, careless teenagers could turn this into a pile of rubble. Assembly was very straight forward. Can theses Sauna's stay outside?